President elect Donald Trump has a tough job on this hands. Generating jobs which remains his is principle mandate and the biggest reason he feels he has been elected for will be an enormous challenge specially in the US auto sector. By threatening to levy additional tariffs on cars produced in Mexico, Trump is calling for US car makers to continue to manufacture in United States. However as a recent bloomberg story shows it may be more free trade, not tariffs, that would help the U.S. keep some factory jobs from moving south. 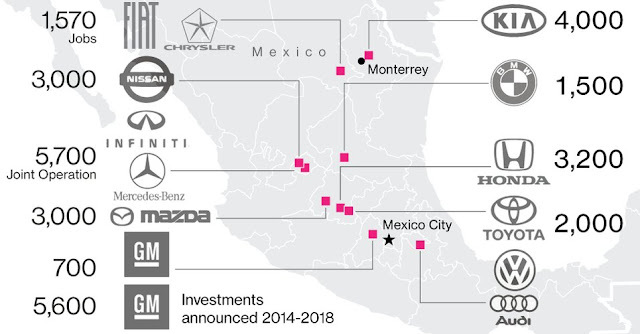 Over the past five years, automakers have rushed to build factories in Mexico. The largest car companies have announced at least $22 billion in investments and about 25,000 jobs at new or expanded plants in Mexico by 2019. And that’s just the jobs that have been made public. 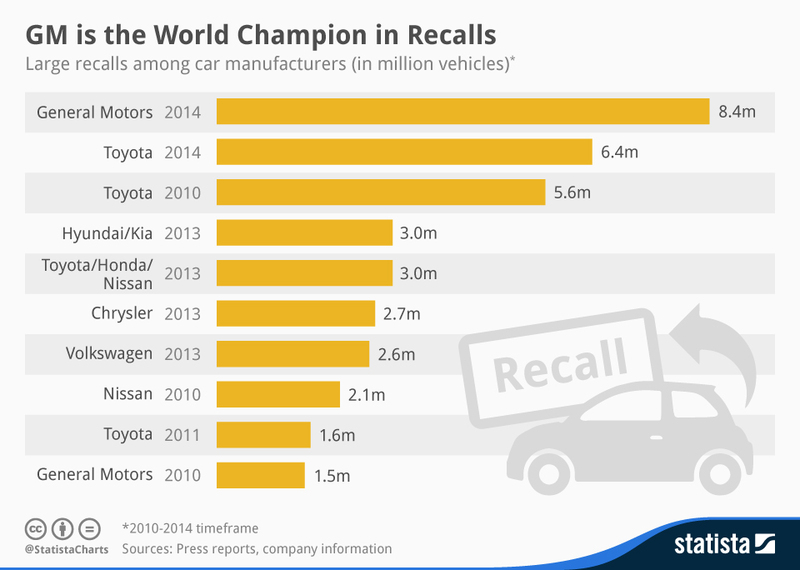 So what do US car makers actually gain to have manufacturing shipped off to mexico before being shipped to be sold to United States ?. 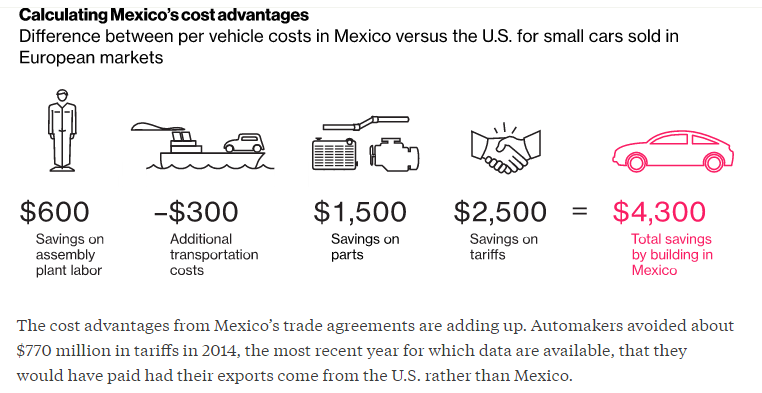 Here are 3 reasons why "US car makers are more favorably disposed to Mexico and rather build and manufacture cars there compared to US"
1) Cost of Labor :Cheaper labor is only one reason Mexico has seen a surge in new-car production. While the country’s low wages have been the big attraction, one of its key advantages is that it has is trade agreements. 2)Trade Agreements : Mexico has trade agreements with 44 countries, giving automakers access to half the global car market tariff-free.The U.S. has similar trade deals with just 20 countries, which make up 9% of global car sales, according to the Center for Automotive Research in Ann Arbor, Michigan. "It’s pretty ironic that what makes Mexico successful is free trade," said Kristen Dziczek, an analyst at CAR "You can look at the new investment that has gone into Mexico and while a huge portion is for the U.S., they are selling a lot elsewhere, too." Most importantly the bulk of the savings are tied to Mexico’s trade agreements and cheaper parts.Consider this! Automakers can save $1,500 per car on cheaper Mexican auto parts.  Certainly, a lot of those savings are tied to the lower wages workers in Mexico are paid. But some of these parts are imported to Mexico tariff-free from countries in Europe and Asia, particularly for the foreign automakers who are increasingly investing in Mexico instead of the U.S. Since the U.S. doesn’t have as many free trade agreements, some of the automakers need would pay extra for some of those parts if they made those models in the U.S which significantly increase the cost of production of cars in United States. Elon Musk is promising to give a fantastic holiday gift to those who have the patience to wait. Tesla's CEO tweeted Thursday night that it "Looks like we might be ready to rollout most of Autopilot functionality for HW2 towards the end of next week." Musk is referring to new self driven car models built from October on that contain the hardware capable of full-on autonomous driving as part of its Enhanced Autopilot driver assist feature. None of the systems were to enabled, however, until a yet to be announced December date, which now looks to be during the week between Christmas and New Years'.The rollout is expected to be incremental, first enabling safety systems like adaptive cruise control and autonomous emergency braking. This brings Tesla's new Model X and Model S vehicles in line with the older Teslas currently on the road. 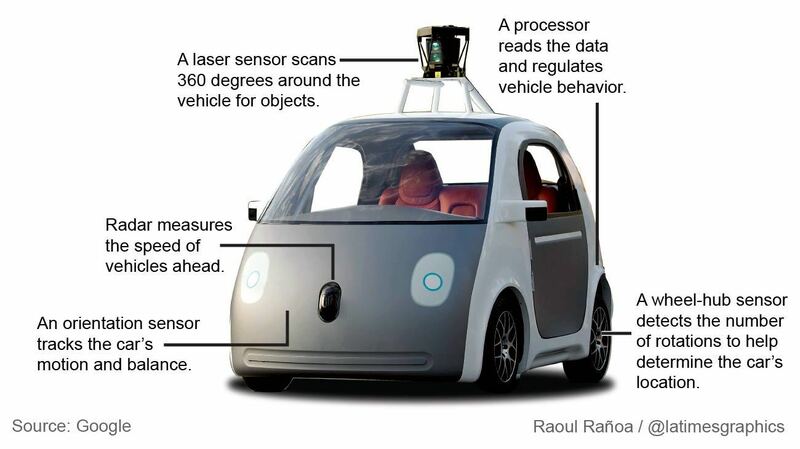 Google is backing off from manufacturing self driven cars. It had earlier Touted its autonomous self driven cars as the technology of the future. In the summer of 2015, Google experimented its self drive car with a blind man, Steve Mahan, had “driven”, unaccompanied, one of its Koala cars on the public roads of Austin, Texas. That trip was the world’s first fully driverless trip on public roads..
Google is stepping back from its " highly ambitious self driving card project. According to recent reports Google Parent company Alphabet has shelved its long-standing plan to develop its own autonomous vehicle in favor of pursuing partnerships with existing car makers.Google’s self-driving cars which had sprung up from its “moonshot division”, X labs, had become a full-blown subsidiary of umbrella group Alphabet, called Waymo. The new company, headed by X alumni John Krafcik, was assigned with " creating self-driving car technology that Google has been developing behind closed doors into a viable business for the future. However it seems Google's plan to creating self driven cars is in a limbo and have been tucked away in the deep freezer. The One thing Waymo won’t be doing is building its own cars – a step back in ambition from the highest goals of the X labs team. “We are a self-driving technology company,” Krafcik said. “We’ve been really clear that we’re not a car company, although there’s been some confusion on that point. We’re not in the business of making better cars. We’re in the business of making better drivers Now those who have followed Google's self driven car ambition, might find this to be a complete U turn . Google has it first set out to reinvent " self driving , by doing away with the steering wheel and pedals however it backtracked on this after after CEO Larry Page and CFO Ruth Porat, found the original approach to be “impractical,” according to Techcrunch. So for consumers who wanted to drive the " Google Car" you can forget about it.Apparently the best hope for someone who wants to get their hands on Google’s software looks to be Fiat Chrysler, who signed a deal with Google in May to put its self-driving tech in a small fleet of the company’s Pacifica minivans. If that deal expands into a full-blown partnership, Fiat Chrysler could be the first company selling Google tech to end users. The chart shows the worlds biggest top 10 car manufacturer by marketshare . 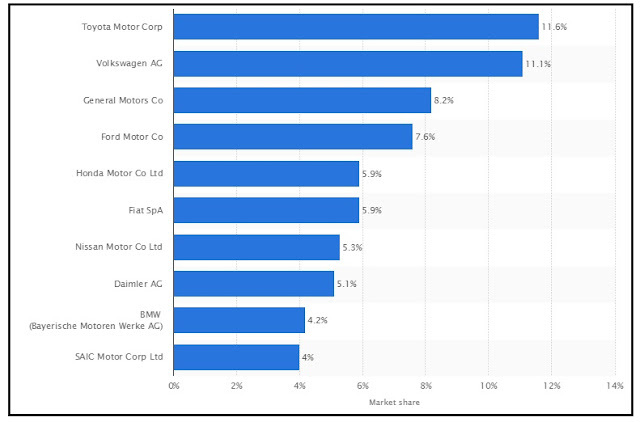 Toyota and Volkswagen with 11.6% and 11.1% respectively are the biggest OEM's followed by among worlds bigger car markers by marketshare, followed by General Motors, with 8.2%.